The garden reflecting the owner. It’s been a while since I’ve been to see Showcase 1, so I popped over to check in. 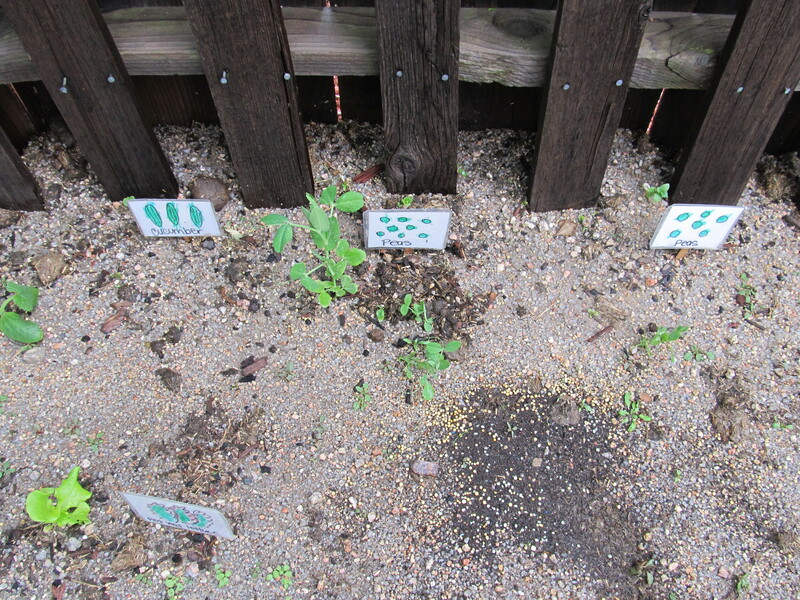 The plants got the earliest start of all of the gardens I’m playing in, so there were lots of seedlings sprouting. She had also put in some warm-weather crops. They went in a little earlier than I had suggested, but we hadn’t had any frosts, so they were doing ok, just growing slowly at the moment. The labels are so cute. 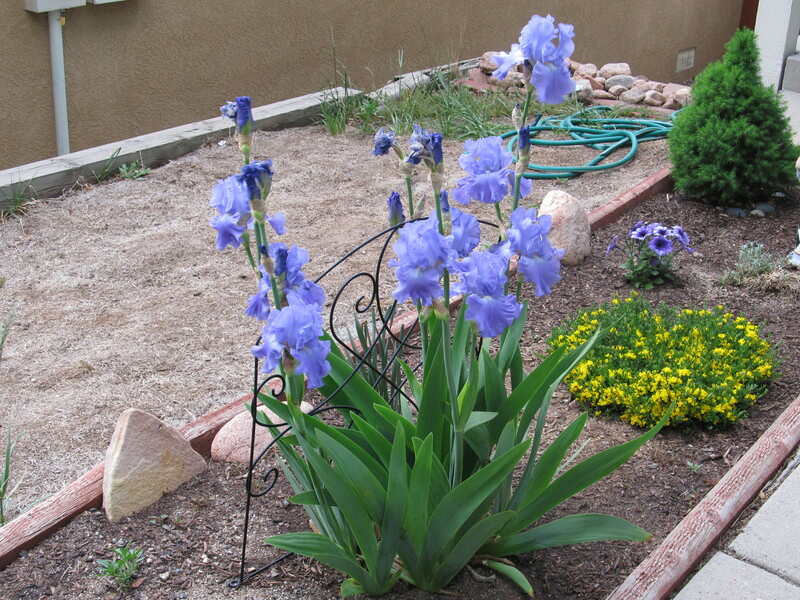 Aside from all the seedlings and transplants happily growing away, and the irises that were tickled pink about their move to the front yard, the best part about the garden was that the owner, well, owned it. A garden is a garden is a garden until it gets those touches that make it yours. In this case, it was a prettily paved path and plant labels that her daughter helped her color in. When I started talking to people about letting me play in their gardens, I kept hearing “Plant whatever you want.” The thing is, I don’t want to have lots of my gardens dotted around town. 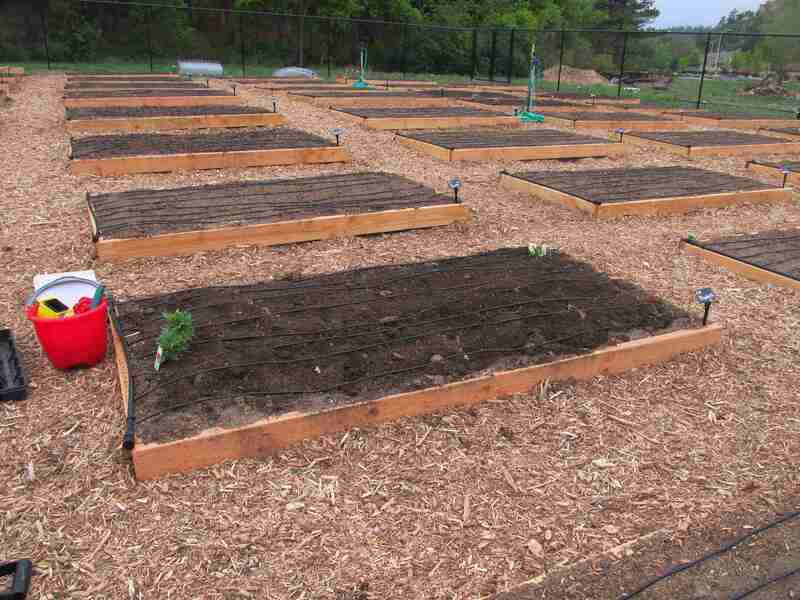 I want to help people grow their gardens. Of course I will offer opinions about some things, but in the end, the garden should reflect the owner more than the advice-giver. It’s amazing what a little elbow room and manure can do. Bed A getting ready for manure. I have two beds in the Ranch Community Garden. In a burst of inspiration, I dubbed them A and B. As a single person, I probably don’t need two beds, but it should give me enough vegetables to preserve some and eat a lot. Any extras I’ll just send along with the food that is grown for the food bank. I threw my name in the hat for a second bed if there were unclaimed plots. By cultivating it instead of leaving it fallow, I will be improving it for the next person that wants to use it. Bed A with manure, pansies, and marigolds. It’s funny what you hold onto from childhood. Being the child of two science-oriented people, I looked at my two beds and immediately determined that this required an experiment. Bed A will be the “improved” bed, while bed B will be “unimproved.” It isn’t a pure experiment, as the local soil has already been improved with mulch over the winter and the transplants are adding a bit of potting soil. However, bed A is also getting cow manure and some worm casings. The tomatoes are both going in bed A, because tomatoes like rich soil, and I really want them to be successful. There’s nothing quite like garden tomatoes. The greenbeans are also going in bed A, because I have one trellis and that’s where it’s located. Bed B got the chamomile plants and will be more onion/garlic heavy because tomatoes and onions don’t get along too well. Nor do beans and garlic. I planted some garlic chives and three garlic cloves in bed B. The cloves are definitely an experiment. The ones that Heirloom Gardens planted back in March or April seem to be doing fine, so we’ll see if you can plant them as late as mid-May and still get any growth out of them. 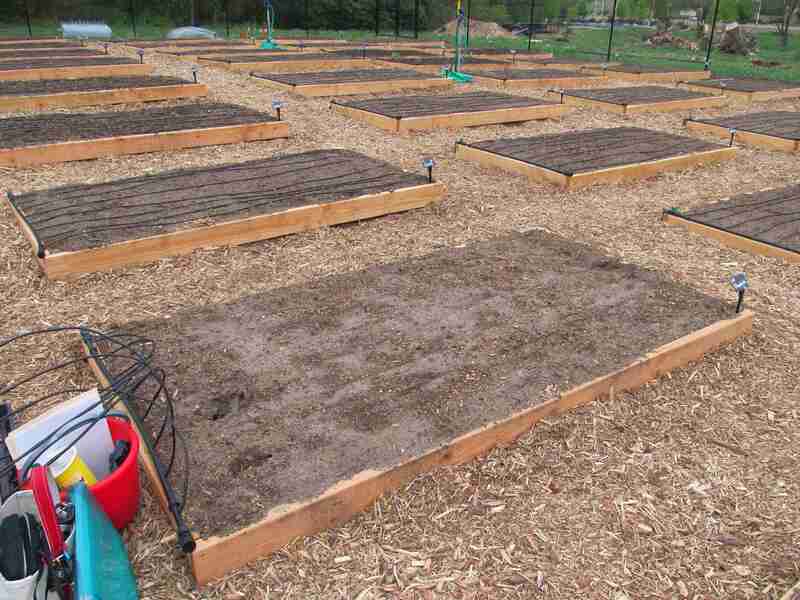 What is identical between the two beds is one square each of carrots, onions, lettuce, beets, and turnips. There are also two squares of kale and half a square of radishes. I used the same variety in each bed, and they are planted with the same orientation. I am very curious to see if there is any difference between them. 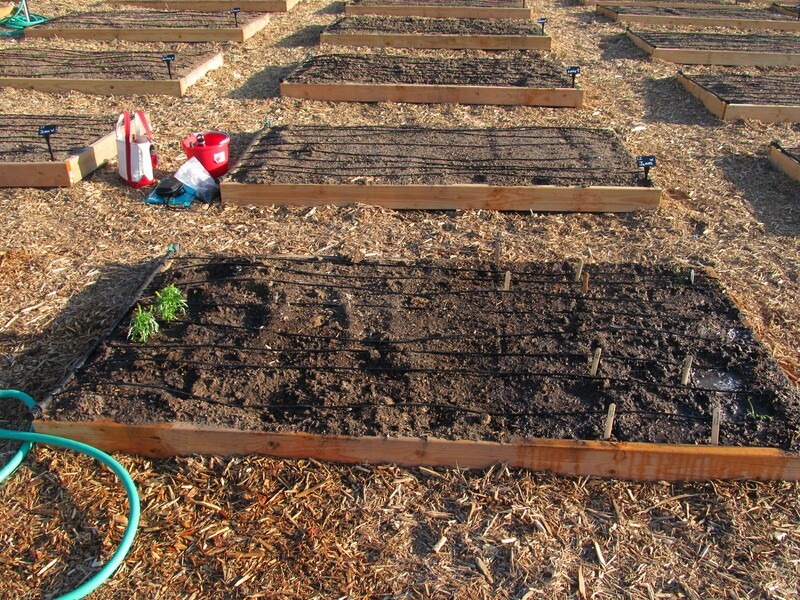 I am using the Square-Foot method and staggering the plantings so that I can stagger the harvests. Other than the leeks, which need to go in bed B shortly, most of the additional squares will be identical between the beds to provide additional data. I am also growing marigolds and pansies. Both are potentially edible, make sure your marigold is the real thing, Calendula officinalis, but I am growing them for other reasons. Fruit, in this case, my tomatoes, are the result of fertilized flowers. With the exception of wind-pollinated species, you will need pollinators to make sure the flowers are fertilized. Having additional flowers in the garden means that pollinators will already be seeing my plots as feeding grounds when the tomatoes blossom, increasing my odds of setting fruit. The marigolds are also to help protect my tomatoes from nematodes or roundworms. There are some beneficial varieties of nematodes, but most of them are not too friendly. The more years I can grow marigolds, the fewer nematodes I will be concerned about. My last note is a cautionary one. If you are a slightly neglectful gardener, which is something I swear I know nothing about, don’t forget to water your plants the days after you transplant them as well as the day of. The marigolds took the day of neglect pretty well. The pansies, however, were far more dramatic in their opinion. They are, fortunately, thinking about forgiving me for it and growing anyway. So far, two beds and compost. It took me a while to get to it, but I finally got the second bed dug for Showcase 2. 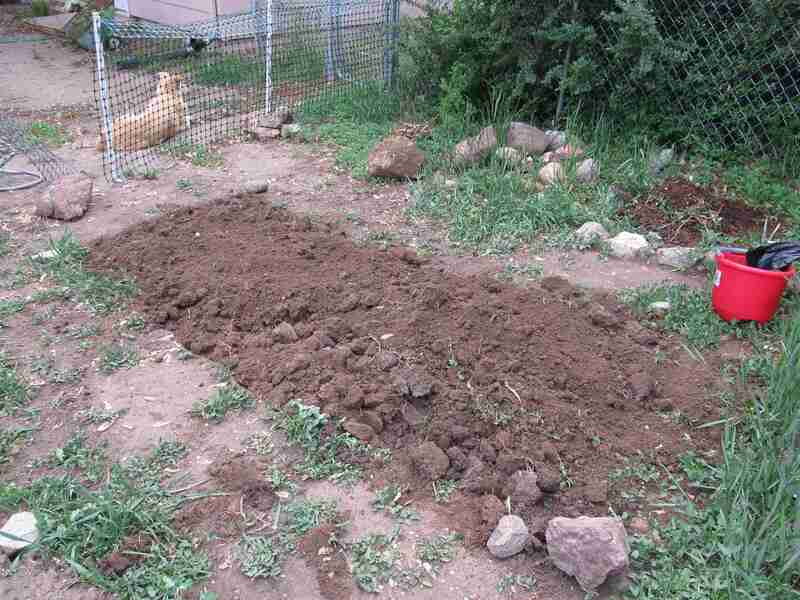 It took about two and a half hours to double-dig the 4×8′ plot. It’s a little bigger than the potato plot, but with the rain we’ve been having recently, the ground was also a little softer. I ran into a few different things with this plot than I did with the potato bed. The potatoes, by the way, are doing great. Every one of them has at least broken through the ground, and some of them are getting pretty big. I do need to track down some straw, though, to mulch them. If there’s only one rock, make it count. I ran into a few different issues with this bed. I dug up more sticks and roots than you can, well, shake a stick at. I suspect that the roots are from the bush behind the compost piles. I also found out why I wasn’t digging up any rocks. They were all concentrated in a single cubic foot. It was heavy. There was also proof of the mess that construction can make. In a couple of different places, I ran into construction sand. Considering that it was in the second layer each time, it had to have been from the original construction of the house. It is getting mixed in with the rest of the soil so that I don’t have little bits of beach in the garden, but that will have at least a slight effect on the soil texture. The changes are particularly interesting because this bed is two feet away from the potato bed, yet had almost totally different things to deal with. In a natural setting, two plots that close should be pretty similar. Clearly, that is not the case in an urban setting. 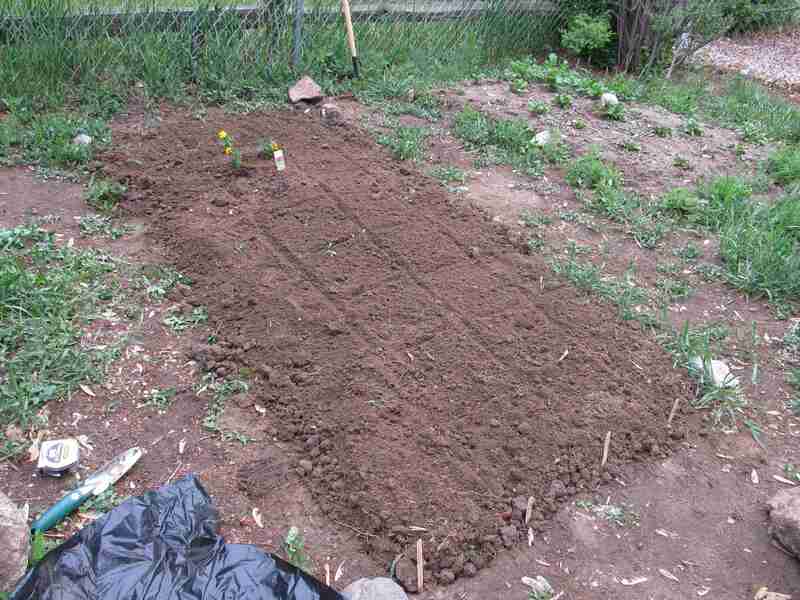 I dug it over on Thursday night and didn’t make it back to rake it smooth and start planting until Sunday afternoon. I didn’t get in as much as I’d hoped, since rain was coming and I needed to get some stuff in my community garden plots. However, I did get two squares each of carrots and onions and the marigolds were planted up near where the tomatoes will be once we pick them up. 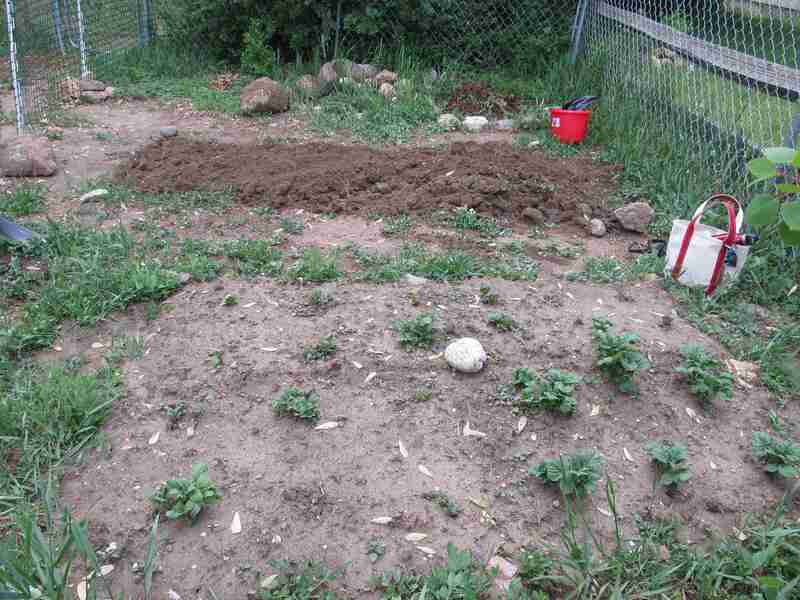 Because this bed will be something that doesn’t have a “close date,” we opted to grow the parsnips in this garden. They take something like forever to grow, but this way we can leave them in the ground for a frost or two, or possibly overwinter them. We will also be putting in a proper fall planting of garlic so that we have it for next year. I am planning on adding kale in late summer so that we can see how that winters over as well. Overseeing the gardener can really wear you out. There are mountains over there. Somewhere. As I was driving up to the Saturday class this past weekend, I was noticing the change in perspective that low clouds can cause. Our landscape is dominated by the mountains that we live in the shadow of. On the rare occasion that they disappear, all of a sudden the foreground is visible. 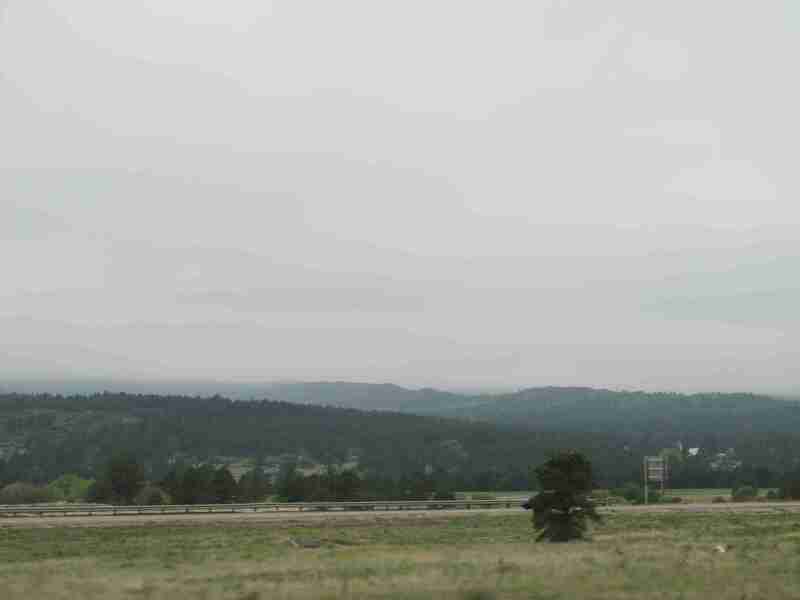 On the drive, I saw buildings and shapes in the landscape that I had never noticed before because my eyes are usually drawn past them to the mountains. I also noticed that the horizon-to-horizon gray had a different effect on me than it did when I lived in Maryland. In Maryland, the effect is just depressing. Part of that is probably because it may stay that way for a week or more. Out here, I got the impression of a fuzzy, comforting blanket. This may or may not have been influenced by the fuzzy fleece I was wearing and the fact that the car heater was on to combat the chill. However, it was good to know there was moisture in the sky and that the low clouds were keeping the sun from immediately drying the rain that had fallen the night before. I loved the wagons. It was just like going to an Amish market with my Mom when I was growing up. When I read the description for the class, I got the impression that it was someone who had been burned by a landscaper and they were trying to keep others from suffering the same fate. I felt like I was taking it under false pretenses, as I intend to be a landscaper of sorts but I wanted to know what questions might be asked. I clearly mis-read the description, though, because it was presented by Curtis Manning, one of the partners of the Arcadia Design Group, a design and build landscaping firm. He decided to give this class because when it comes to landscaping, design in particular, the market doesn’t understand the product. The class is to help educate homeowners so that they have some idea of what to expect from a landscaper and how to communicate effectively with the person or firm they choose to hire. While he conceded that there are some bad apples in the industry, like every other industry, most of the problems are caused by lack of understanding or insufficient communication between the firm and the client. I like this idea of using food plants as ornamentals. It’s both decorative and useful. The two major points I got from this presentation were budget and details. Know your budget. How much are you willing and able to spend? If you are not willing to provide a hard number, at least provide a range so that your landscaper doesn’t plan a $50,000 overhaul when you have $10,000 to spend. Details came up over and over again. 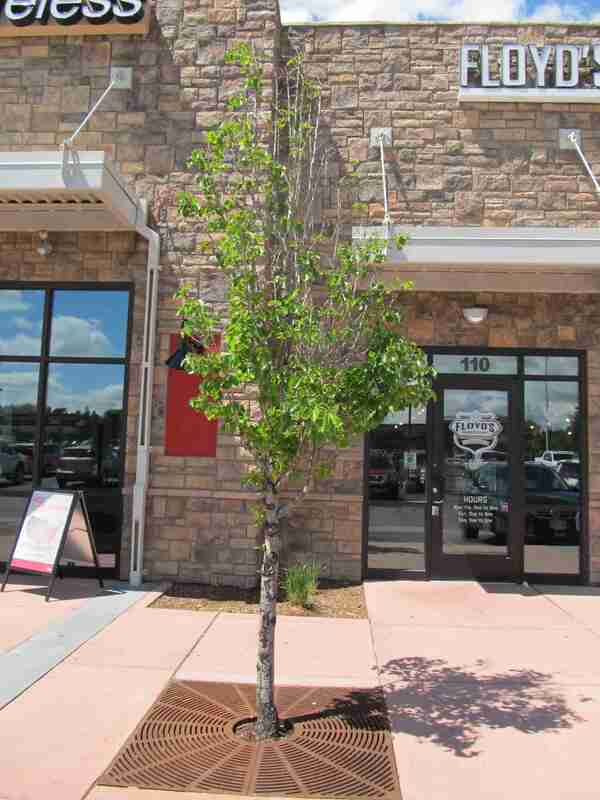 The more detailed you are in describing what you want, the more information the landscaper has to work with. They, in turn, should be able to provide you with details about timing, materials, and how to contact them with questions. Woven through this was the idea that a good company will work with you. They want you to be happy with your investment just as much as you do. While it is a job, and they do have to make a living, for many it is also a passion. Your budget can actually affect a fair number of pieces for this puzzle. The amount of money you have to spend can help you narrow the choices of firms. What is too large or small for one firm to be able to handle might be exactly what another firm is set up for. If you have a particular firm in mind but have less to spend than their usual clients, you may need to wait for a slower time of year for them to fit you in. The other thing to consider is whether the budget is all you are willing to spend on the project or if you might have assets to spend on it in the future. Curtis, and other landscapers I have been taking classes from, are generally happy to phase in a project over time if that is how your budget can support your dream. I think this modest selection showed remarkable restraint. It’s also supporting a good cause. When Curtis was discussing what to look for in a design, he showed us a couple of what I hope were unusual examples first. They lacked detail and explanation. If the company that is doing the design is also doing the building, they can omit some minor details if certain things are always constructed a certain way. However, if it is a stand-alone design that you are taking to a different company to build for you, the construction company should not have any questions. Then he showed us one of his. There were multiple views and so many details that it looked like a building blueprint or electronics schematic. While his company both designs and builds, his designs are sold separately from the building bid. On the off chance that the client liked the design but chose to go with another construction firm, all of the details the other company would need will be in the design. The contracts should have a similar level of detail so that it is very clear who is responsible for what along with how and when it will be completed. The short version of the class is to be an educated consumer. Don’t be afraid to ask questions and follow up with references. 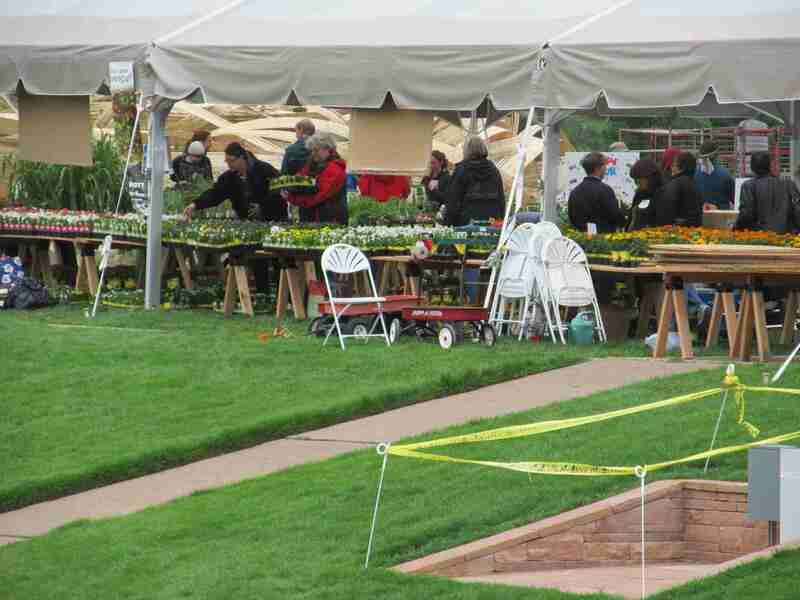 There are nearly as many kinds of landscapers as there are landscaping businesses. During the busy season, which is now, they are very busy and may not be able to answer your questions immediately, but a good firm or individual will answer your questions. The class was slated for one hour, but took about two because of the amount of information he had to share and his willingness to answer our questions. 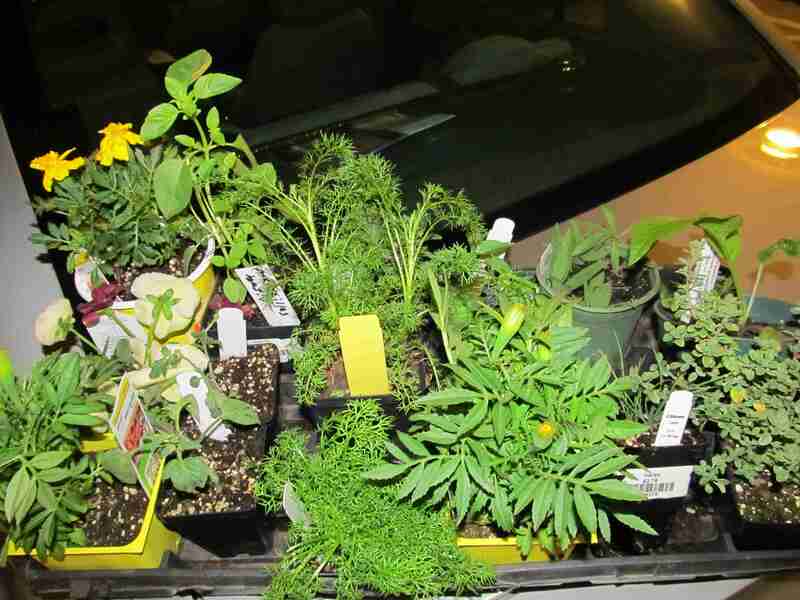 I am going to blame mulling over the information for distracting me and causing my window-shopping at the end of the plant sale to turn into actual shopping. This class was taught by Jean Reeder, Ph.D. soil scientist. She spent 30 years with the USDA ARS, the agricultural research service. Since retirement, she is now a consultant for the CSU Soil Testing Lab and she is one of the instructors for the Colorado Master Gardener program. She has also discovered that she didn’t really understand the soil in her own back yard. 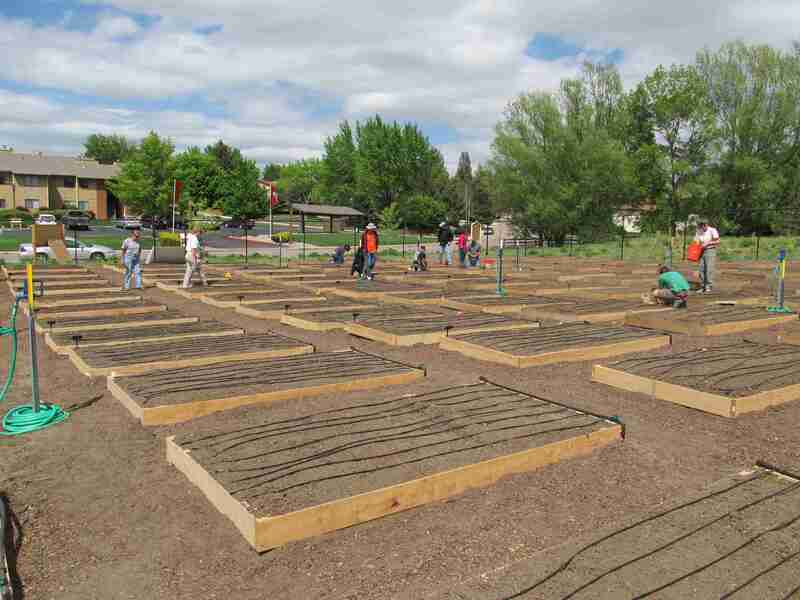 Of natural, agricultural, and urban soils, urban soils are the most complex and the least understood. She has begun applying her skills to changing that. Anyone who lives in Colorado knows that we face a lot of challenges. Our semi-arid climate is cool with a short growing season, dry, and highly variable in both temperature and precipitation. However, more than 80% of plant problems are because of the soil. It is the fundamental component of the landscape. That makes it the biggest challenge. However, it is also the least understood. We have even less information to go on than most of the country, as our soil is as different as our weather. Where most soil is more acid, ours is alkaline. If you find a native soil around here that is 2% organic matter, you’re doing really well. In Iowa, 6-7% organic matter is perfectly normal. We also have free lime. She told us about one woman she knew that preferred to send her soil samples to a lab in Missouri to be tested. They never tested for free lime, since it isn’t an issue in Missouri. There were a few main points I got from this class. The first is, test your soil. The old saying is “feed and nurture the soil and the soil will feed an nurture the plants.” That’s true, but how do you know how to nurture it if you don’t know where it is now? Sending off samples for testing is a bit more expensive than picking up a soil test kit at the store. However, you get a lot more information and a lot more accuracy. The other thing is to get it tested locally. I use the CSU service. Granted, the lab is in Fort Collins, which is not exactly around the corner from Colorado Springs, but they know Colorado. They know about free lime and our increasing problem with salt in our soils. They can tell me how to manage it in a way that will work here. The kits you can pick up at the store are apparently usually calibrated for acidic soils, which makes them worse than useless in our alkaline soils. They also don’t come with instructions for fixing any issues you have. Once you get your test results back, there are a couple of things that it is best to just make peace with. The pH and the texture are almost impossible to change, and any changes may have other consequences. Our soils tend to be more clayey. One apparent solution is to add sand. Aside from the fact that you have to add too much sand for that to be practical, the recipe for concrete is lime and sand. It’s not a guarantee, but if you’re unlucky, you might end up with a concrete slab where you had intended to put in a garden. As for pH, our soils are very well buffered, so they resist being changed. One possible change is to add sulfur. However, if you have a high-calcium soil (lime is usually calcium carbonate), you end up making gypsum. Gypsum is used in places as a fertilizer. However, it is a salt, so you will be increasing the salt content of your soil. The only way to change the pH with any hope of permanence is to manage the garden correctly and consistently for about 50 or 100 years or move to the mountains. There are some old gardens and gardens in the mountains that are slightly acidic. However, those are the exception not the rule. The result of squished roots and a rough spring. Now that you have made peace with your texture and pH, it’s time to talk about amendments. All amendments are not created equal. In fact, all compost is not created equal. We do not have naturally saline soils. However, the application of high-salt fertilizers, both organic and not, is turning salt into a problem. There’s a reason people used to salt the fields of their enemies. 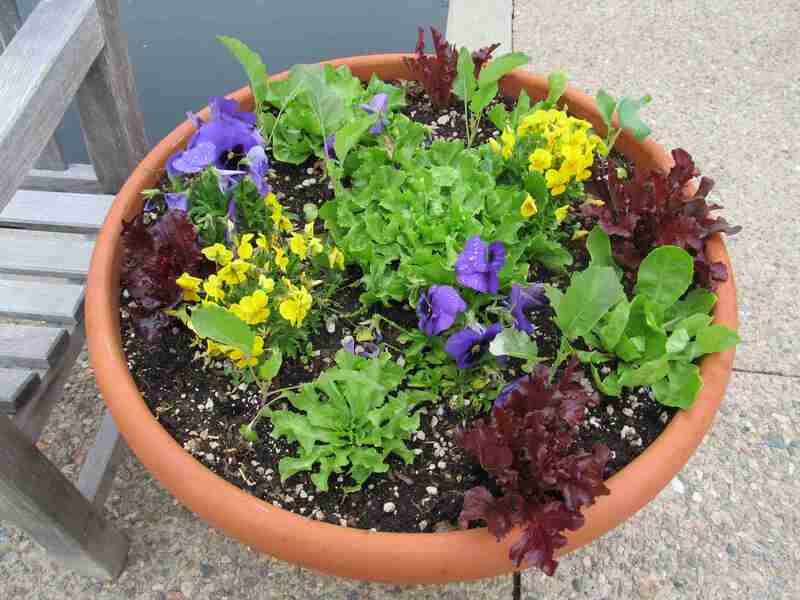 You can’t grow anything in salted soil and, unless you have massive amounts of high-quality water to flush the salts through the soil layers, it is almost impossible to fix. She did a study of bagged, commercial fertilizer. However, it never got published because the only consistency was that animal-based ones had very high salt content and plant-based ones tended to have merely high salt content. Other than that, there was no telling what would come out of a particular bag. Even if you go natural, there is still a huge variation in what you can get. She showed us numbers of actual fertilizers she had analyzed from non-bagged sources. The numbers were all over the place. Including two that ended up with toxic amounts of trace minerals and several that were going to cause salt issues if they were used with any regularity. If you are considering using your neighbor’s horse manure, she mentioned that what they are fed affects the quality of the manure. The quality of what goes in affects the quality of what comes out the other end. Think about that for a minute. I sure did. This one isn’t too happy with it’s placement either. The last major point is compaction. I have run across this as being a problem in gardens before, but she took it to another level. 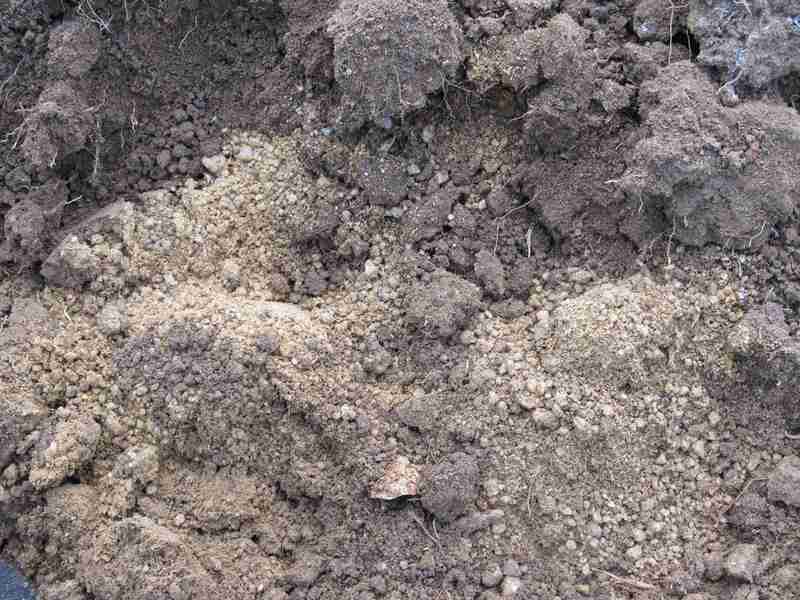 Compacted soil means that the aggregates in the soil, the structure made from the mineral content and the organic material, have been destroyed, which means that there are few if any pores in the soil for air and water to penetrate. 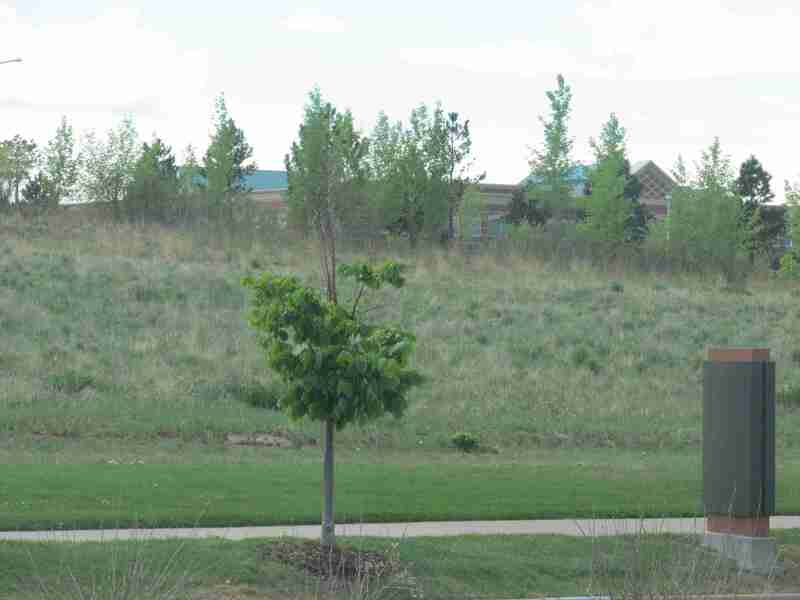 If you live in an urban area, it’s best to assume that your soil is compacted. If you are able to do so, you will want to fix that before you put down lawn and gardens, as it is almost impossible to fix later. 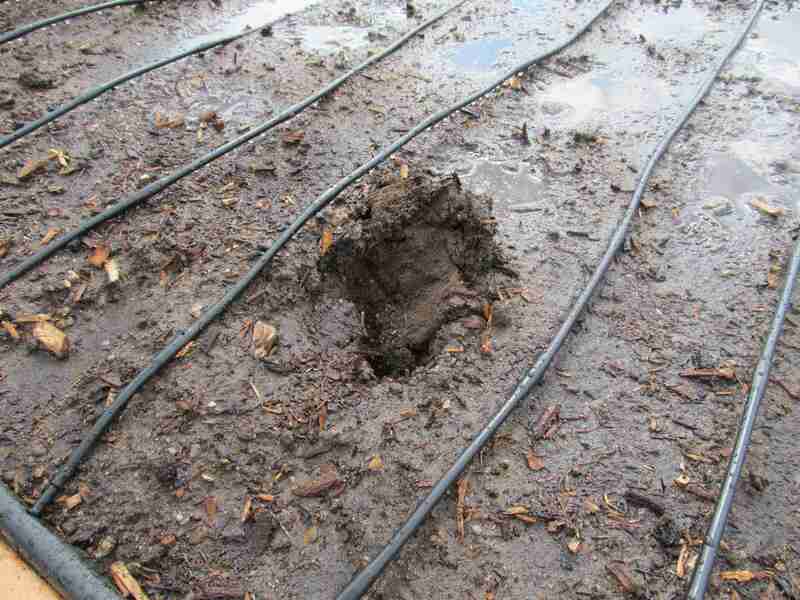 If your soil has no, or few, pores with air and water, roots will not have anywhere to go, or a reason to go there. 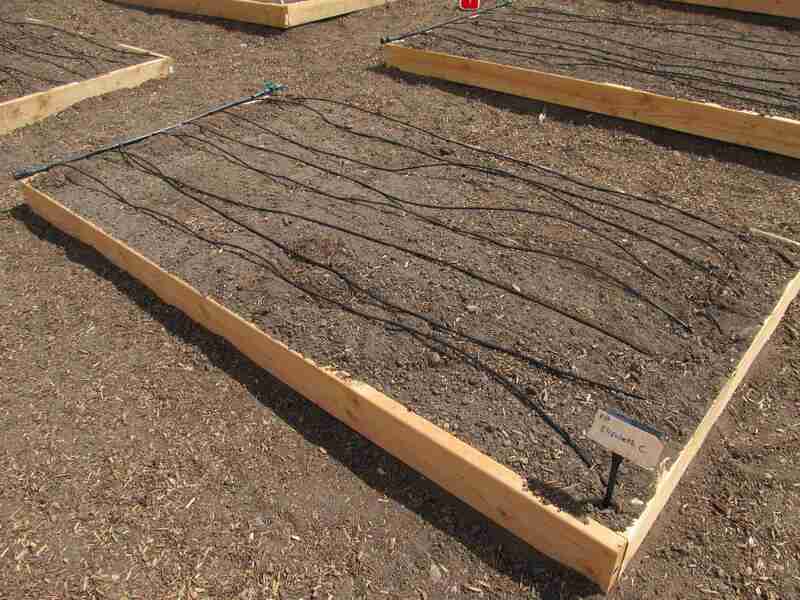 The smaller and more restricted a root system is, the smaller the above-ground part of the plant will be. I have notice small trees in “hell strips” between the sidewalk and the road recently that are only leafing out on their lower branches. This is apparently a result of restricted root growth combined with a dry spring. The upper branches had to be sacrificed because the limited roots couldn’t support them in the rough conditions we have had this spring. If it wasn’t trapped between the compaction under the road and the compaction under the sidewalk, the roots would be able to spread out, giving them half a chance to support the growth that had gone on before conditions got bad. When you walk across wet, loose ground once, you just compacted that ground by 75%. If you walk across it four times, now it’s 90% compacted. Now think about the damage a bulldozer or crane will do while the house is being constructed. The overarching concept from this class is that, with two exceptions, less is more. On average, it takes about 150 years to build an inch of topsoil in nature. Colorado would need more time than average. Therefore, taking 10 years to slowly build a to-die-for garden is still well above average. The fewer amendments you use, the less likely you are to make a mistake. If you salt your garden or add toxic levels of a nutrient, you will be spending a lot of time and money to fix it. Along the same lines, once our native soil has been disrupted, she let me know that it is very hard, very expensive, and often heartbreaking to restore it. The less of the native landscape we disrupt, the less we will have to painstakingly restore. Tilling and other machines tend to break up soil aggregates, affecting the soil structure. Hand-digging is far less likely to do so. What we need more of is patience and knowledge, hence the slightly lengthy post. Your soil is unique. The more information you can gather, and the more time you can spend with it, the better equipped you will be to know how to nurture it. The garden is now open for business! The chain-link part of the fence will be going up next Saturday, and the drip-system should be on by then as well. In the meantime, the plots have all been marked out for each gardener. I did get my second one, since there were leftovers, but there are still a few more yet to be claimed. The grand opening was a fairly low-key affair. There was water and tea and a couple of trays of grocery store vegetables. The speechmaking was also kept to a minimum. Shane, who’s brainchild this is, welcomed us, and let us know that his goal for the garden is to build community. At the end of the year there would be another party, but this time using our vegetables. There were a couple of rules to go over, like no walking in the beds and no animals outside of the picnic area, then we were let loose. The rest of the time was meeting people, sharing seeds and ideas, and finding our beds. The beds were very dry. It hadn’t rained for several weeks, and the beds have been bare to the sun in that time. It didn’t make sense to plant much, if anything, before the fence went up and the drip-system was turned on, but most of us were out there starting to water down our beds. The soil was so dry that it simply wasn’t soaking up the water with any speed. Shane let us know that if we dug small channels and divots in our beds, the water would have somewhere to pool until it could soak in. It did help. As I was digging in my bed and watering it, I couldn’t help but think about a documentary I watched some time ago, Blue Gold: World Water Wars. I need to watch it again, as it has a lot of information. However, what has stuck with me is the solution to desertification. This is something that we are fighting the world over as what used to be lush areas good for farming are turning into deserts. At the end of the film the narrator had a whiteboard setup and it looked like a fairly big deal. He starts with telling us to dig holes. I kept waiting for some technological or complicated next step. There wasn’t one. We need to dig holes. 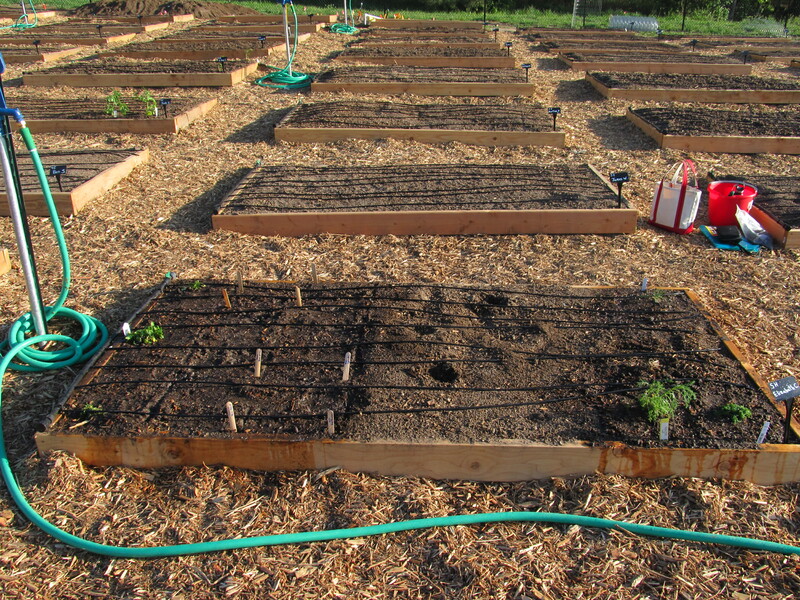 When soil has moisture, it is easier for it to accept more moisture up to the saturation point. When it has no moisture already in it, it is far easier for the rainfall to simply roll off the top. This is compounded if the soil has developed a crust as many clay soils do. 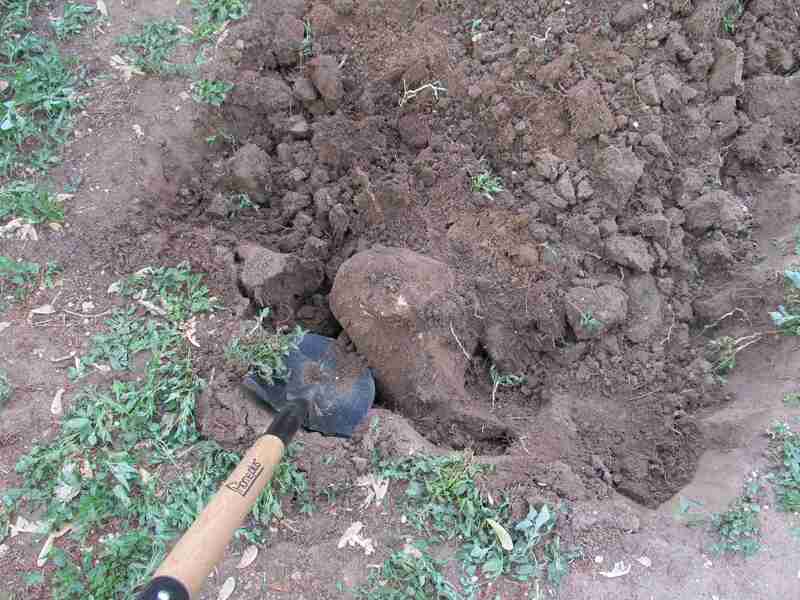 By digging holes, you are forcing the water to stay where it is until it soaks into the surrounding soil. This moisture will then make the surrounding soil more likely to take up water the next time it rains. It’s going to take some time to wet it all the way through. I’m sure the rain helped. I overheard one of the gardeners quip that because we were all watering our beds today, it would be sure to rain that night. Sometimes Mother Nature is unpredictable. Sometimes, she’s right on cue. The grand opening was on Sunday. Sunday night it rained. Monday remained overcast with occasional rain and very wet snow. When the clouds were clearing this morning, I could see that the snow was more serious up in the mountains. I will be out there again later this week. One of the women has cow manure to share, so she and I will be spreading it on our plots. 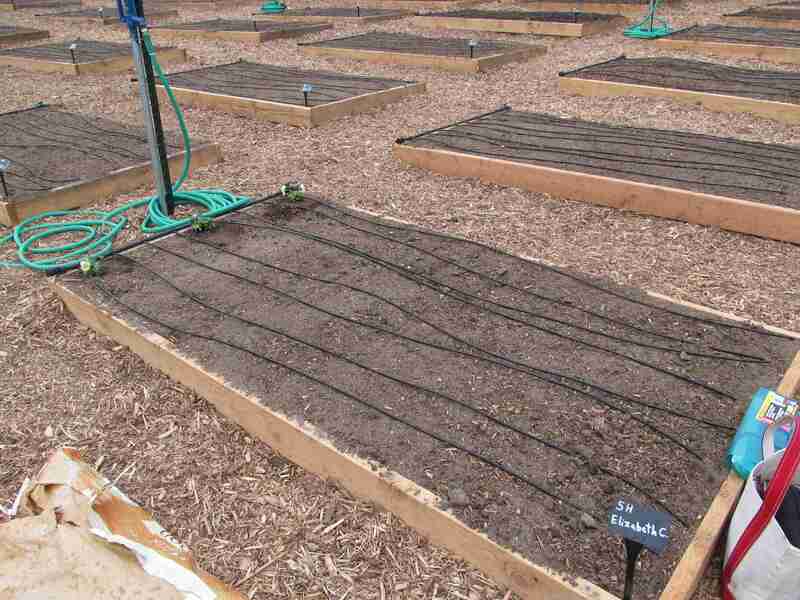 Depending on how far the rain, and snow, were able to penetrate into the soil, I might even stick a few seeds in at the same time. 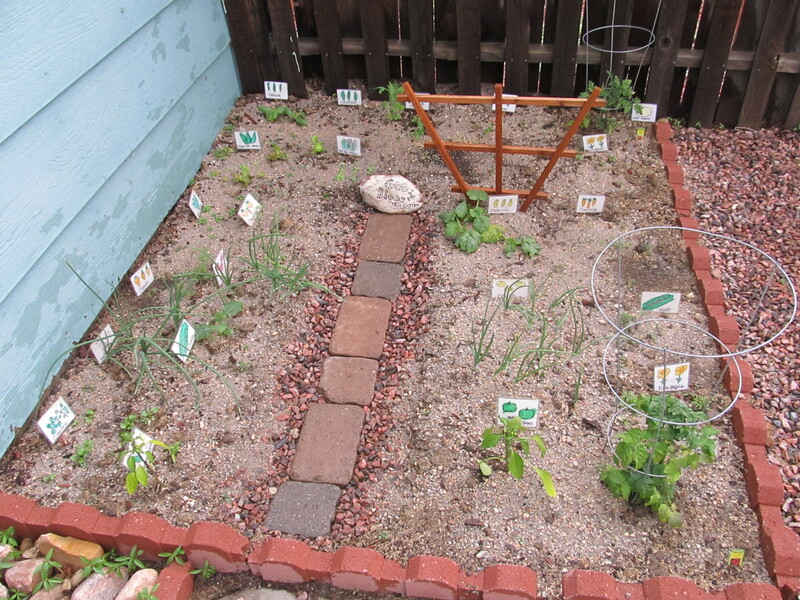 I can’t wait to get the garden that is all mine started. Bath tea on the right, extra supplies on the left. I took the Herbal Mother’s Day Gifts some time ago, but I wanted to wait to post it until the birthday presents I took it for were already in the mail. Due to my impressive promptness with making them, I managed to take Herbal First Aid Kits in the meantime. Both were given by Christina Blume of Blume’s Farm. She actually began her fascination with herbs due to the need in grad school to have one more advanced anthropology class. She chose a class on medicines in other cultures. 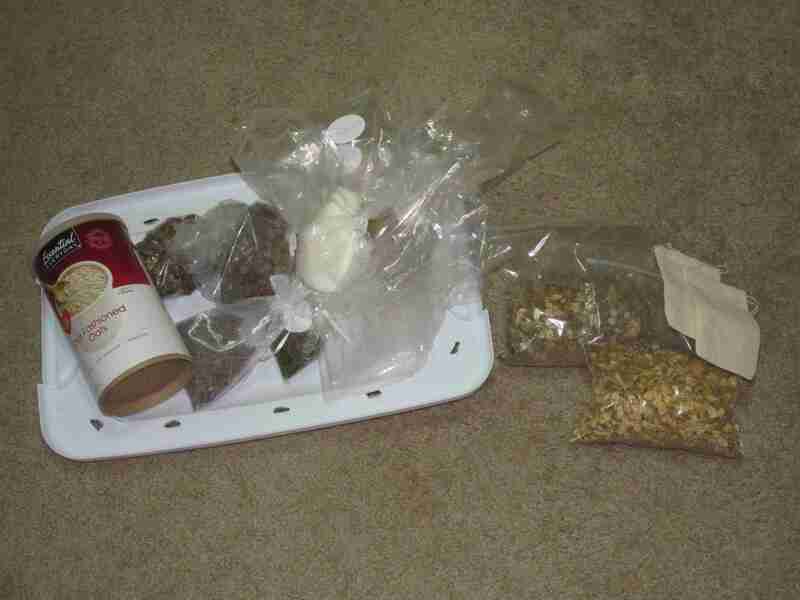 The herbs spoke to her, causing her to change paths and travel the country learning everything she could. Both of these classes were on the expensive side for the Denver Botanic Gardens, but I did come home with some pretty cool loot. The first class, Herbal Mother’s Day Gifts, was a fairly small group, which was probably a good thing considering the hands-on nature of the class. Christina handled the preparations that were melted, but we made our own spritzer/cologne and “Easy Bath Bombs.” It turns out that balsam fir and lavender make a sharp, refreshing spritzer. The bath bombs will require a little more practice. The dry and liquid ingredients need to be mixed carefully so they don’t fizz before you drop the finished bomb into your bath. Practice will help me develop the feel of the mixture to pack into the molds. Any failures will still work very well to keep my skin soft in the meantime. While we were working on the bath bombs, I got to chat with the women I was sharing my batch of ingredients with. It turns out they like to learn various crafts together and then use what they learn to make gifts for friends and family. The gifts are pretty universally well received. I’m going to need to remember this next time it’s time for presents. It smelled slightly of peanuts. Looks pretty though. The second class, Herbal First Aid Kits, offered more practical goodies for an accident-prone person like myself. Christina showed us a couple of preparations, although there were too many people in the class for us to get to do things ourselves. She also gave me permission to share a recipe from the class. I chose the herbal bactine, or Echinacea Plus Tincture, because of it’s general usefulness internally or externally. Grind the herbs in a food processor or blender. Pour into a jar with a tight-fitting lid and cover with Everclear to one inch above the herbs. 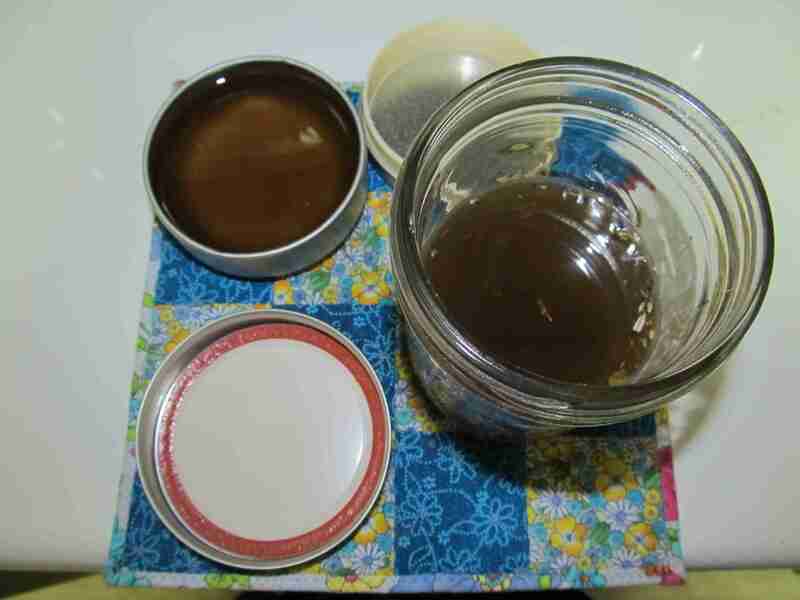 Put a layer of waxed paper between the jar and the lid. Shake once or twice a day for two weeks. Strain through a cotton cloth and store in a dark bottle with a tight-fitting lid. This can be used on any cut, scrape. or wound as a disinfectant and anti-microbial. Due to the alcohol content, it will sting when applied. Internally, take 1/2 a teaspoon in a small amount of juice every two hours the first day. I need to work on my straining skills. The Everclear is needed for the myrrh. As a resin, it needs a higher alcohol content to actually make a tincture. Most of them work very well with cheap vodka for a lower alcohol content. However, it is also one of the best antimicrobials there is. Apparently, its use for embalming protected the embalmers in the Middle East during times of plague. You may want to make the Echinacea tincture separately as well. 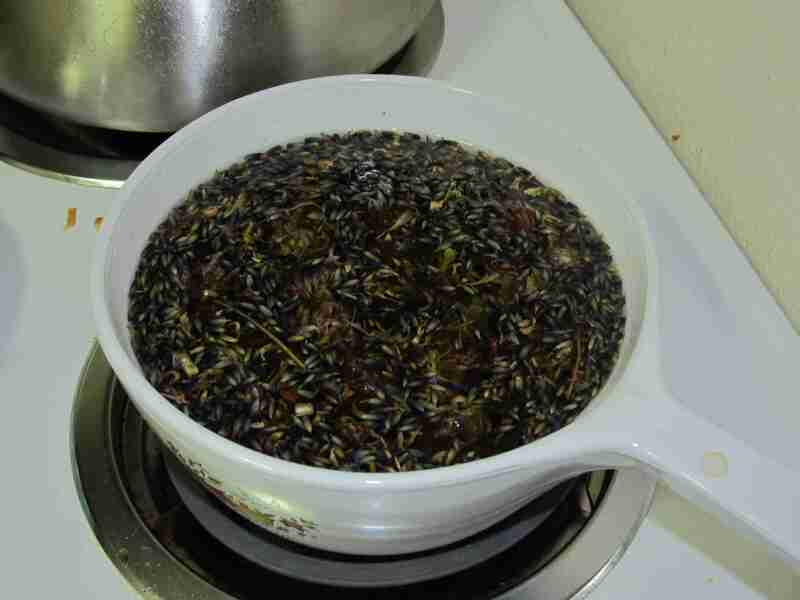 With most, tinctures, the alcohol will extract the pertinent parts of the herb. For Echinacea, however, the polysaccharides, which don’t come out with alcohol, are also pertinent. After you strain the solids out of the alcohol, you will want to simmer the solids in water to extract them. When you add the second extraction to the first, the amount of 50% of the water portion will also need to be added in additional alcohol. Between the two classes, there were lots of interesting tidbits. 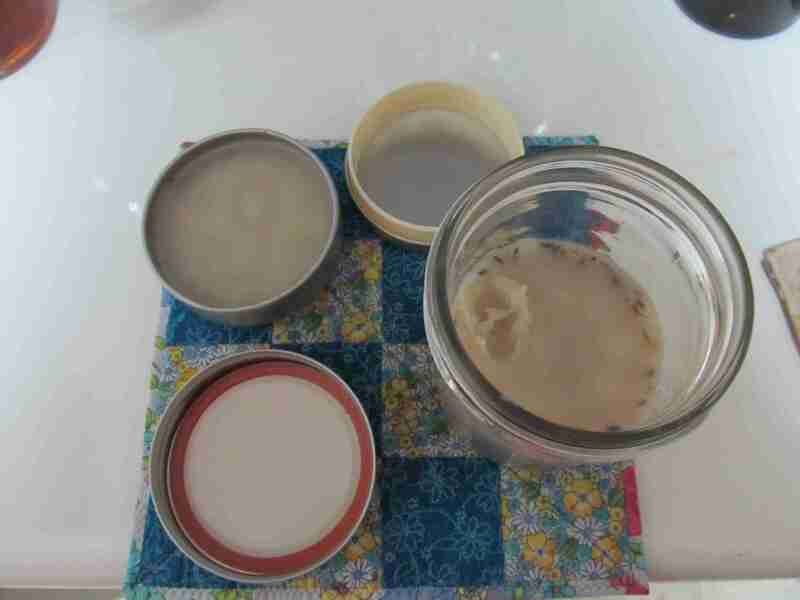 Most of her salves are made with olive oil, but the “Sole Softener” recipe calls for castor oil. It is far more penetrating and healing on its own. Given the tenacity of it while I was making the sole softener, I’m not so surprised that a god was named after it. It gets on everything, but my hands felt great afterward. I also found out that essential oils are not necessarily a good idea for use by expecting mothers. For those gifts, you might want to stick with whole herbs, as they don’t have the same potency while still being useful. If you need comfrey root, leave the grinding to the professionals. Apparently it will destroy regular kitchen utensils. Cooled and ready to be mailed. The one with the fingerprint and the poor straining will be staying with me. I need to weigh which classes I can afford to take this year and which ones I really should put off, but she has a class for a full home kit coming up that I think would be a good investment. Now that I know where to find my herbs, Mountain Mama’s, although I hear that Vitamin Cottage is also really good and found outside of Colorado Springs, it’s something that I want to play with more. Next time I pick up bits and pieces at the grocery store, however, I might opt not to pick up a saline laxative (epsom salts, great bath salts) and a liquid laxative (castor oil, for the sole softener) in bulk at the same time. The cashier was clearly wondering if my day was going as badly as it appeared.